Find Scottish Fold Cat Breeders! The Scottish Fold is a beautiful cat with an adorable, kittenish expression. Despite this, the reasons for their folded ears is the cause of a health controversy. This has meant they are recognized by some cat clubs and not others. They are also relatively rare and normally prospective owners have to wait to get a kitten. The defining characteristic of the Scottish Fold is, of course, its ears. Bending forward and downwards, they give the cat an almost ‘owl-like’ expression. With their wide, round faces the resulting look is very teddy bear like. The folded ears are caused by an incomplete dominance gene that originated through a mutation many years ago. What this means is that both folded ear and normal eared (upright) type kittens can be produced. Kittens which have the folded ears are still born with them straight, the fold develops at around three to four weeks of age. Only folded-eared cats are able to be shown, yet the straight eared kittens can still be useful in breeding programs. The fold is a medium sized breed with a round face and chunky body, yet it is not as heavy as the British Shorthair which appears in its ancestry many years back. The nose is short, which adds to its appealing facial expression. The eyes are large and round, meaning the fold looks ‘kittenish’ for all its adult life. The main point to remember in regards to the breed standard with the Scottish Fold is that everything should be round; round face, round eyes, round paws, and even a round body! The coat of the Scottish Fold is short and dense, requiring little grooming. All colors are permissible, which gives prospective owners a wide range to choose from. The fold comes in a shorthaired and longhaired variety. Unlike the Persian, the longhaired variety is more of a fine, semi-longhair type and as such grooming two to three times a week should be adequate. The Scottish Fold is a relatively new breed that of course, originated in Scotland. The first fold appeared in the 1960’s and was a little female called Susie. She lived on a farm in the Tayside region and had produced a litter of kittens that included two with folded ears. One of these kittens was given to their neighbors, William and Mary Ross. This white female christened Snooks, became the foundation queen for their breeding program as they were determined to produce more of these enchanting little cats. By crossing them with British Shorthairs and regular moggies they started producing the very first Scottish Folds. The Governing Council of the Cat Fancy (GCCF) in the UK recognized this new breed but later withdrew this in 1971 after becoming concerned about hearing problems the folds caused. However, many folds were exported to the US which enabled the breed to become established there in the late 1970’s. Finally, it was recognized in by the Cat Fanciers Association in 1977. Over the years it has gone from strength to strength in the US, coming in as the 10th most popular breed in recent years based on kitten registrations. To this day, the GCCF refuses to recognize the Scottish Fold as a breed due to its concerns about the gene responsible for the folded ears. More about this can be found in the health section. 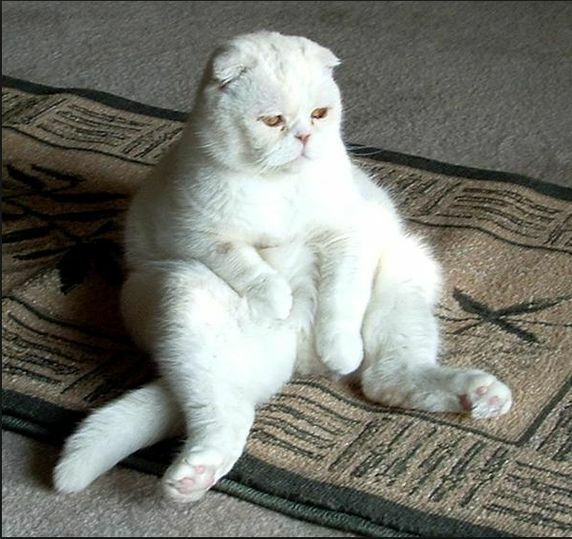 Of course, this doesn’t mean that you cannot get the Scottish Fold in the UK. They are still available but are generally registered with The International Cat Association (TICA) instead as this club operates worldwide. The Scottish Fold is a breed that does cause controversy in regards to its health conditions as it is recognized in the US and many other countries, yet is still not recognized by the main cat club of the UK, the GCCF. The gene that is responsible for causing the fold in the ears causes an abnormality of the cartilage. This means that the ear is not supported and as such folds over when the kittens are a few weeks old. The name for this abnormality is Osteochondrodysplasia. If this disease affects other areas of the body it can cause severe developmental problems. Now this gene is genetic and as such is passed on from parents to offspring. If a kitten has a double dose of the gene, it is known as homozygous for the gene. This is where two Scottish Folds with folded ears are bred together and therefore the kitten gets a copy of the gene from each parent. These kittens will always have osteochondrodysplasia in a severe form. Many kittens do not survive and it they do, they will suffer from arthritis from a very early age that is debilitating and reduced their quality of life. Physical signs can be lameness, a short inflexible tail, and swollen limb joints. Euthanasia is often the only option for these cats. Breeders should therefore never breed two folded eared cats together. Instead, the normal pattern is to breed a folded eared cat to a straight eared Scottish Fold cat. This way, the kittens are heterozygous for the gene, meaning that they have only one copy from the folded eared parent. Only some of the kittens will develop the required folded ears. There is however, controversy surrounding this breed. In a cat that is heterozygous for the gene (i.e. is bred from a folded eared and straight eared parent), any kittens with folded ears will still suffer from osteochondrodysplasia, albeit in a less dramatic form. The severity of the condition can vary between individuals. Some show lameness as young as 6 months of age while others appear relatively healthy throughout their lives. The pain caused by this condition can never be cured, but it can be managed with pain medication. This is the reason the GCCF in the UK has refused to recognize the breed, yet as stated TICA and the CFA do. Most Scottish Fold breeders will breed cats with folded ears to either folds with straight ears or an American or British Shorthair. These last two breeds are permitted outcrosses which help maintain genetic diversity and are also free from the abnormal gene. Despite early concerns, there is no evidence to suggest that the Scottish Fold is prone to deafness due to its ear shape. It is otherwise a healthy breed, with the only other concern being that it may need its ears cleaning more frequently due to a build-up of ear wax. The Scottish Fold is an inquisitive, sociable little cat that enjoys spending time with its owners. Although they are not noisy, or as demanding as other breeds, they love companionship and like to see what is going on. Scottish Folds are also known to be complete characters. They often like playing with running water, playing fetch and will eat with their paws. Many Folds like to sit on their back legs with their front paws raised up, in their well-known ‘Buddha’ pose. They waste many hours sitting in the sun in this slightly unorthodox position. If you have children the Scottish Fold is a good choice. They enjoy being petted providing the children have been told how to treat animals kindly. The Fold will also get on well with other pets if introduced carefully and slowly. Saying that, they are not great lap cats, preferring instead to sitting next to you while being petted. Their playful nature means they enjoy playing with bits of string and other cat toys. The Scottish Fold is like most cats, an intelligent breed. Saying this, they are not as high energy as others such as the Siamese. Training them to perform normal tasks such as using a litter tray or coming when called should be fairly easy. Use food as a treat when getting them to respond to their name. If you are trying to get their attention at dinner time, consider tapping the dish to attract their attention. They will start to associate this with feeding time and will come at the sound of this cue. Unlike many of the more popular breeds, the Scottish Fold has not be capitalized on by backyard breeders looking to make a quick buck. This is because it is hard to produce cats with the folded ears, as such there is normally a waiting list for kittens. Of course, this does mean that straight eared Scottish Folds are cheaper than kittens with folded ears. Most breeders will be very picky about where their kittens end up. Always ensure you see the mother of the kittens, although the breeder may not own the father (stud cat) of the litter. They should have been bred from a straight eared parent (either a fold or shorthair as described in the health section) and a folded parent. If you are buying a folded-eared kitten, then their ears should already be folded on collection. If the breeder says the ears still need to fold or drop at the time of collection, do not believe them! Kittens should be ready to go to their new homes at around 12-13 weeks of age, once they have had their initial vaccinations. Expect to pay between $350 to $1200 for a fold kitten, with straight eared folds at the lower end of the spectrum. Expect to pay more for folds that can be bred from, many breeders place restrictions on their kittens stating that their offspring cannot be registered if they do not believe them to be of a high enough standard. Your kitten should be registered with an appropriate organizing body such as TICA or the CFA. Registering a kitten guarantees that it is a pedigree, do not buy an unregistered kitten. When you collect your kitten, you should receive the relevant paperwork plus the change of ownership information. If you are planning on letting your kitten outside, check with your veterinarian to make sure they have had all the vaccinations they need. Some areas may require additional jabs. If you are not planning on breeding from your kitten then it is important to get them neutered. Un-neutered male cats will mark their territory by spraying urine, a smelly and unwelcome habit. Females will come into season, a noisy event that attracts males from far and wide. Neutering helps prevent these problems. Budget around $50-$150 for this cost with females costing more than males as the operation is more complicated. Your Scottish Fold will also need a good quality diet. Cats are not designed to eat large amounts of carbohydrates, which are often added to bulk out low-quality diets. Pick a brand with a high meat content instead. They will also need regular worming and flea treatment. Flea treatments are a topical application placed on the back of the neck each month and are available either online or from your veterinarian. Worming should take place every three months if your fold goes outside (due to the higher risk) or every six months if they are a house cat. Allowing $150 per year should be plenty for these two treatments. Finally, it is always worth getting pet insurance. This will help you pay for any unexpected vets bills and help provide you with peace of mind in case your pet gets ill. Just remember that it will not cover routine costs such as worming and flea treatments. When choosing insurance, it pays to shop around. Always read the small print and check how much the excess is on your policy. Overall, budget around $200 per year for insurance with a decent provider.